Here is the list of Best Free Sound Booster Software for Windows. These software are used to boost sound levels of various audio/video files. These sound booster software come in handy to boost audio file with very low volume. These music boosters are categorised in two categories, namely System Volume Booster and Media Players. System Volume Booster software can boost sound of the whole system, means, you get boosted audio irrespective of media players you use to play music. Whereas, Media Players can only boost sound of audio files being played by them. To boost sound, these free sound boosters use various tools, like Equalizer, Pre-Amplifiers, Volume Controller, etc. These tools are are good at boosting volume, but at the same time, they can also distort sound quality. So, use these tools carefully, specially the Equalizer, as it can completely change the various audio parameters like treble, bass, voice, etc., and introduce noise in audio. Many of these mentioned sound boosters are media players with the ability to boost sound. They possess many common media player features, like: audio/video player, filter, playlists, jump forward/backward slider and buttons, etc. Apart from these common features, some of these players have some very interesting tools, namely: VR support, 360 degree player, online radio, online video player, media downloader, audio editors, etc. DFX Audio Enhancer and VLC Media Player are my favorite sound booster software. Both of these provide considerable amount of boost with least noise. In DFX Audio Enhancer, you can boost sound level of whole system, irrespective of which media player you use to play music. Whereas, in VLC Media Player, you can easily boost sound just by scrolling the mouse wheel over volume option. The quality of audio remains quite fair, even after boosting sound with these freeware. You can also checkout these free Media Players, MKV Video Player, Slow Motion Video Player for Windows. DFX Audio Enhancer is a free sound booster software for Windows. This software helps you boost sound levels of PC beyond 100%. This sound booster software takes over the default audio drivers of PC to boost sound. Due to this, you can play audio in any audio/video player and still get boosted sound levels. To boost sound, you get various settings, like Dynamic Boost, Hyper bass, Ambience, Fidelity, 3D surround, etc. Each of these sound settings has a slider to change sound levels from 1 to 10. But, apart from Hyperbass, you cannot move slider beyond level 5 in other settings and 3D surround is completely disabled in this free version. To overcome these limitations, you will have to purchase its paid version. Listening Environment: Using this, you can either choose headphone or speaker options to get optimal sound. But, headphones option is disabled in this free version. Music Types: This option provides three music types, namely, music type 1, music type2, and speech. Presets: It lets you save multiple sound profiles, so that you can use them when needed. Equalizer: By using this option, you can boost various audio parameters up to 12 db. Note: This software provides most of the options with some restrictions; however, the free version provides good amount of sound boost. VLC Media Player is a free and open source media player software for Windows. It is also one of the most popular media player software available. This media player can also be used as a sound booster, as it provides various settings that effect sound performance. This software provides broadly two options to boost sound. In first option, you just have to move the mouse scroll wheel in upward direction, while mouse is over its interface. By doing so, you will notice that the maximum sound level goes to 125% for audio files and 200% for video files. Thus, VLC provides 25% and 100% sound boost for audio and video files, respectively. Equalizer: VLC provides a 10-band equalizer. Adjust the equalizer bands according to the boost in audio you require. It also provides presets for music genre, like rock, pop, party, etc. Compressor: This option contains various options to tweak audio performance. But the only option that helps to boost sound is Makeup Gain option. It can boost audio output up to 22 db. Spatializer: It helps you boost sound by varying various audio parameters, like size, width, wet, dry, and damp. These options provide very minimal audio gain over original audio. The main advantage of this media player is that it supports almost all of the audio formats, so you can easily listen and boost audio of any audio format. Unfortunately, you cannot save boosted audio with this volume booster software. Equalizer APO is a free parametric/graphic equalizer for Windows that can be used to boost audio on your PC. It can be used to modify various audio parameters, like pitch, treble, bass, audio boost, etc. It works with all media players, as it boosts overall system sound. In this free audio booster software, you will get lots of options and settings to modify audio, which makes this software quite comprehensive, and a bit complicated as well. When you open this software, you can view two panel: Tools Panel and Analysis Panel. In Tools panel, you can add various audio tools to modify overall PC audio output. Here you can add tools like: Basic Filters, Parametric Filters, Controls, Graphic Equalizer, Advanced Filters, etc. In Analysis panel, you can analyze audio output. It lets you view Peak Gain, Latency, Channel, resolution, etc., and audio output Graph. To boost audio you will need to add various audio tools in the Tools panel of this software. Click the green + button to view and add audio tools from various categories. Add Graphic Equalizer to the Tools panel. You can either add 15 band, 31 band, or variable equalizer. You can vary the equalizer bands to boost audio output according to your choice. Just be careful with equalizer, as maxing up channels unevenly can really distort the output audio. Go to Basic filters and add preamp tool. In this tool, you can either boost sound by moving the knob or manually entering gain values. But, by using knob you can only boost sound up to 20 db, whereas manually, you can enter much greater values. In the Parametric Filter category, add the Low Shelf and High Shelf filters. In both of these filters, you get three knobs to change parameters like Gain, Centre frequency, Corner frequency, and Slope. You can adjust knobs or enter values manually to boost sound. Apart from various audio tools, you can also choose various channel configuration (mono, 5.1 surround, 7.1 surround, stereo, quadraphonic, etc.) and Devices (headphones, speakers, etc.) to get optimum output sound using this free audio booster software. GOM Media Player is another commonly used free media player for Windows, with the ability to boost sound. In this music booster freeware, you can play audio and videos of various formats, and then boost their audio. This software also provides some Advanced Settings, like filters, 3D effects, audio effects, output device settings, etc. You can access these advanced settings either by pressing F5 key or by pressing the Settings (preferences) icon near the top left corner of the interface. This sound booster basically provides two methods to boost audio, namely, Volume and Control Panel. In Volume, you get a volume slider to increase/decrease volume. Unlike normal sliders, this slider can increase volume beyond 100% and go up to 150% level. But after 100% volume level, quality of audio starts deteriorating. Whereas, in Control Panel, you can boost audio in its Audio section. In the Audio Section, you can vary audio frequencies between -12 to 12 db by adjusting frequency sliders. But, it provides almost negligible audio boost. So, in my opinion, you should use Volume Controller to boost sound. As a media player, it provides many interesting features, like 360 degree player, 360 degree VR mode, various interface skins, snapshot option, etc. Clementine Music player is a free and well known music player software for Windows. This music player also possess features to boost sound. To boost audio, you can use some common tools, such as, Equalizer and Pre-amplification. To access these tools, just open Tools drop down menu and select Equalizer option. It has a 10 band equalizer with sliders and a Pre-amplification feature. Apart from these settings, Equalizer window also has other handy features, such as: Preset (contains various predefined audio settings), Balance (used to change audio output of left/right speakers), and an option to save custom frequencies. You can boost sound either by increasing the Pre-amplification value or by adjusting Equalizer Frequencies. During testing, I noticed that Pre-amplification option provides significant audio boost. By varying Equalizer bands, not much boost was obtained. Search: To search music on PC as well a on Internet. Library: To add and manage music files. Internet: This option lets you download music from various online sources, namely: Icecast, Jamendo, Dropbox, Amazon cloud, etc. Ultra Payer is a free and compact media player software for Windows. It is capable of handling both audio and video formats. This software can easily boost sound by using its internal 10 band Equalizer. Apart from sound boosting, you get various options, like visualisers, DSP plugins, Playlist, etc. This software has slightly cluttered interface, still I found it easy to use. The audio boosting process is simple, just increase the frequencies of Equalizer according to your choice. Even maxing out the frequency bands of Equalizers does not introduce much noise in audio output. This property makes this software stand out from other music players that use Equalizer to boost sound. Apart from manual equalizing, you can also choose predefined audio profiles, namely: Rock, Jazz, Classical, Dance, etc. to listen audio in different musical genre. VSO Media Player is another free media player with the ability to boost sound. The sound booster is integrated with the default sound controller of this media player. It provides upto 100% boost in audio. This audio booster software can easily play any audio or video files, and boost their sound. As a media player, it has various media player related settings, namely: subtitles, language, video settings, image settings, interface settings, etc. To boost sound, this software uses its volume controller, which can boost sound additionally up to 100% over the default maximum sound. By default, the option to boost sound is enabled, but, if it is not enabled, then go to Menu > Settings > Audio, and enable the Allow audio boost option. After enabling this option, you can view the changes in color and slider position of Volume Controller. To precisely boost audio, its volume controller also shows normal volume levels along with boosted volume levels. Apart from that, you also get an option to play Blu Ray or DVD directly using this software, which is good feature to have. You can also add multiple images in this sound booster and play them as a slideshow. 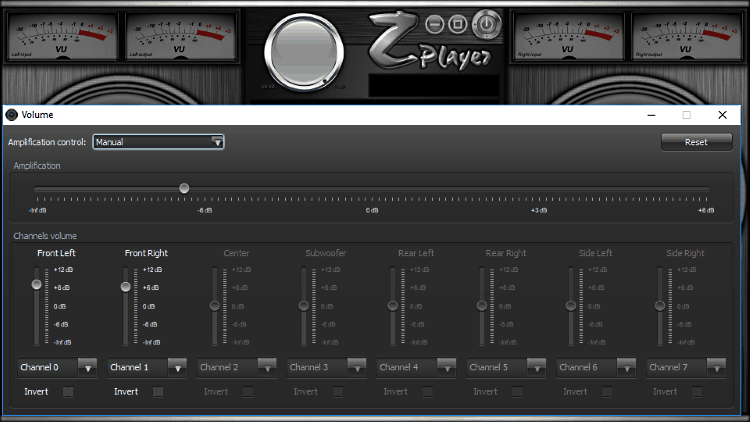 Zplayer is a free sound boosting software for Windows. It mainly uses its volume controller to boost audio. This software is an ideal software to listen and customise audio. It provides various tools to boost audio output, like Filters, Equalizer, Channel volume, Amplification volume, etc. This sound booster has a catchy interface, which also provides some important media tools, namely: spectrum display and oscilloscope meter, that help in analysing audio better. To boost sound, just go to Volume setting by pressing the speaker icon. In Volume setting, first select the manual option from the Amplification control menu, and increase the amplification value by adjusting the amplification slider. Besides this option, you can also boost sound by increasing the front left and front right speaker values individually by using respective slider. This volume booster also has an Equalizer, but during testing I was unable to boost sound using Equalizer. So, I will not recommend its Equalizer to boost sound. SMPlayer is another free media player software for Windows that can boost sound. Here, you can boost audio using the following tools: Extrastereo, Equalizer, and Max Amplifier. Extrastereo: To access this feature, go to, Audio > Filters. Here, you can view the Extrastereo tool. Now, just enable it to get boosted audio. Equalizer: This tool comes under Audio menu. Here you get 10 different variable audio frequency channels. By varying these channels, you can increase/decrease bass, treble, pitch, sound levels, etc. It also allow you to save equalizer profiles. Max Amplifier: To access this feature, click on Options menu and select Preferences. In Preferences, just select General menu and open Audio tab. Now, you can view Max Amplification tool. Here, you can enter amplification values manually to boost audio on PC. Be careful while entering amplification values, as high values can distort audio output. This software also provides other important tools and settings, which are available in Preferences menu. In this menu you will find options like Performance, Subtitles, Interface, File type, and other advanced options. BS.Player is another free media player with the ability to boost sound. Like many other audio boosters, it also uses Equalizer feature to boost sound. This free sound booster software has a modular design and you can easily add and remove various modules like equalizer, playlist, media library, and main interface. To open Equalizer, just press ALT+G or go to Menu > Audio > Equalizer. In Equalizer, you get two features to boost sound, namely: Preamp and 10 Band Frequency panel. To boost sound, you can increase the Preamp value and/or various frequency band values, gradually. BS.Player provides boosted audio while creating minimum distortion. Apart from audio boosting, this software has some interesting features, namely: online radio (which lets you listen as well as download music through it), podcast (to listen audio version of various shows and discussions), Online TV is also available, but it didn’t work for me during testing. All Player is another completely free media player software for Windows. This media player also uses Equalizer option to boost sound. This audio booster is a very good audio and video player. It provides various media player options, like: Audio visualisation, Channel output, Auto resume, Filters, etc. All Player, as a free sound booster software, uses Pre Amplification and Equalizer bands to boost audio. To access these, right click on its interface, go to Sound > Equalizer settings. In Equalizer, you get 10 channel frequency panel and a Pre-amplification slider. Now, just move the respective sliders to boost sound or to vary various audio parameters like Treble, Bass, etc., according to your need. After boosting audio, clarity of sound definitely decreases, still it emanates much clear sound when compared to many other software. Torrent Video Player is another free media player software for Windows. This media player can also be used as a free sound booster. To boost sound, this software provides multiple tools: Graphic Equalizer, Volume Controller, Compressor, and Preamp. Except Volume controller, all other tools can be viewed under Extended settings menu. Volume Controller: This is a normal looking volume controller, but it can boost sound upto 200%. Graphic Equalizer : It provides a 10 band frequency panel and Preamp options. To boost sound, increase various frequency bands and Preamp decibel in a way that least audio noise is generated. Compressor: In compressor, you will find 7 dynamic range parameters, namely: RMS/peak, attack, release, threshold, ratio, knee radius, and makeup gain. To boost sound, only use Threshold and Makeup Gain parameters, as only these two are capable to boost sound significantly. Along with these tools, it also has various other features, namely: video effects, synchronisation, speed controller, jump back/forward slider, etc. 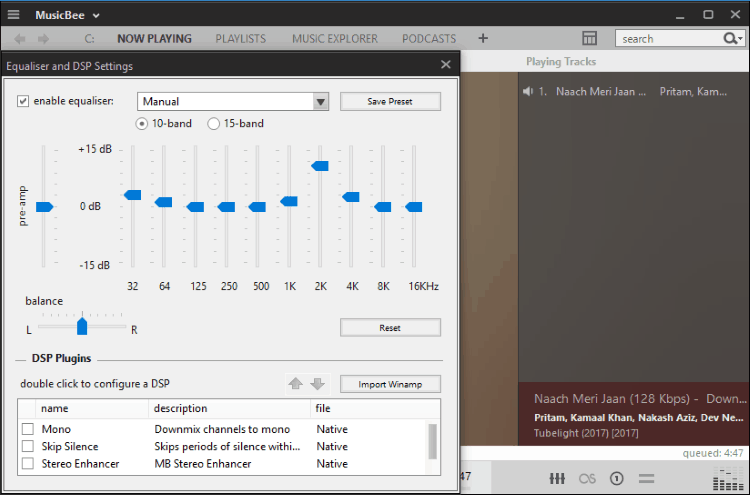 XMplay is another free sound booster software for Windows. To boost audio volume, it has Autoamp and Equalizer. Both of these features available on its interface. You can use, either of these two feature alone or together to boost sound. It supports various audio formats like MP3, MP2, OGG, WAV, WMA, etc. Autoamp: As its name suggests, this feature provides optimum automatic sound amplification or sound boost. You can also turn off auto amplification and amplify audio manually. When the auto mode is On, and you try to adjust the Autoamp slider to boost sound manually, then it reverts back your actions and automatically adjust the slider to an optimum boost level without distortion. Equalizer: It provides a 10 band equalizer panel to change various parameters of audio, like: Bass, Treble, Pitch, etc. You can also boost sound using this option, for that, adjust various frequency sliders gradually in upper direction and analyse the output. While boosting audio using equalizer, be careful, as higher values may introduce noise and distortion in audio. This media player with sound booster also provides various other options, namely: Appearance (contains various interface related features), Miscellaneous (contains track looping/ending, internet streaming options, etc. ), Playlists, Mixing options, Plugins, etc. POT Player is another free media player software for Windows. This media player is also able to boost sound. This sound booster has a very simple and intuitive interface. In this audio booster, you get large number of options to customise sound, but only few options are able to boost audio. First, open any audio file and then click on Settings icon which is present on bottom right corner of interface. This will open a control panel window. This control panel contains various sections including Audio section. Here, you get a 10 band Equalizer, which you can use to boost audio or to change various other audio parameters. To boost audio, just increase various frequency values gradually by moving the respective frequency sliders upwards, specially the 6k, 12k, 14k, and 16k frequency sliders. During testing, I found that only these four frequency values provide the maximum boost. To get more audio related options, just right click on this player’s interface and go to Audio section, where you will get tons of options to enhance audio further. MWPlayer is another free media player software for Windows. In this media player, you can boost sound, play and record online videos, play normal videos, play music, and do much more. This media player is really good at boosting sound, as it provides dedicated volume boosting option. This dedicated option lets you boost sound up to 1000%, which is a lot. This sound booster really helps you to listen any audio file that contains very low audio. To boost sound, just click on Audio option from the toolbar and select Software Volume Boost. Now, place your mouse over this audio booster interface and move mouse wheel in upwards direction to boost audio up to 1000%. But, the clarity of sound also deteriorates with sound boost. Do note, without enabling Software volume boost option, you cannot increase volume more than 100%. This software also provides Stereo modes, which let you choose different stereo modes, namely: 4.0 surround, Full 5.1, Full, 7.1, etc. Spider Player is another free Media Player software for Windows. In this media player, you can boost audio by using internal Equalizer option. The interface of this sound booster is divided into three parts, namely: Media Player, Equalizer, and Playlist. This software also provides a format converter to convert various audios and videos into different formats. The process of boosting sound is similar to above mentioned software with Equalizer. In this music booster, you get a 10 band Equalizer to vary different frequency levels. To boost audio, you have to increase various audio frequencies to boost sound. Apart from that, you can also save Equalizer settings to use them in future. You also get a option to choose various presets, like: Blues, Dance, Flat, Jazz, etc. Along with these features, you also get some handy media tools, like: File Converter, Audio Recorder, Hotkeys, Web Interface, etc. Windows Media Player is a very popular media player software for Windows. This media player also has the capability to boost audio. To do this, first right click on its interface, go to Enhancement > SRS WOW Effects settings. In SRS WOW Effects, you will get two options: Trubass and WOW Effect. In Trubass, you can increase bass levels beyond normal levels by moving its slider. WOW Effects increases the sound levels by increasing the background instruments sound. But, it also introduces lots of noise in audio when you increase the WOW Effects beyond level 65. The main advantage of this sound booster is that it comes with Windows and you don’t have to download any external booster. But, apart from boosting the bass level, it is not very good at boosting the overall sound. Passion Audio Player is a free audio player software for Windows. This audio player can also boost sound. To do that, it uses common audio player tools: Equalizer and Preamp. Both of these options are available on this sound booster’s interface. Sound boosting using these option is easy; just increase the value of Equalizer and Preamp by moving their sliders up. In this music booster, you don’t have to worry about sound quality, because even at full boost, quality of sound remains good. Apart from boosting sound, you can also vary Pitch, Tempo, and Balance of audio. To view every option and settings in details, just go to the Preference menu. In this menu, you get various settings and menus, like: Player skin, Plugins, General options, Encoder options, Audio options, Utilities, Extensions, etc. RealPlayer is another free media player with audio boosting capability for Windows. The Audio boost feature is integrated with its Volume Controller. As a media player, it offers many interesting features, namely: photos and video library, Web video Browser, CD/DVD burn, video down loader, etc. This audio booster only provides one option to boost sound, which is its normal Volume Controller. Unlike, Volume controller of other players, this one can boost volume up to 200% and you can easily feel the boosted audio. Be careful, as with boosted sound, quality of audio will also deteriorate. As a media player, this software provides large number of features, but as a sound booster, it has minimalistic features. Xion Audio Player is a free audio player, which can be used as a free sound booster. Again, this one also lets you boost audio with the help of its Equalizer. This software has a very interactive and modular interface. You can easily add and remove various modules of this software, namely, Playlist, Main interface, Equalizer, Library, etc. For sound boosting, you get only one option, namely, Equalizer. In Equalizer, you get a 10 band frequency panel, Pitch, and Compressor options. To boost sound, just increase the various frequency values. By increasing these frequency values, you can get a boost of up to 15 db. Even at full boost, this sound booster is able to produce clear sound. This software also provides a Xion configuration option, which lets you configure various important settings such as Visualisation, Equalizer, Hot Keys, File Types, Output files, etc. 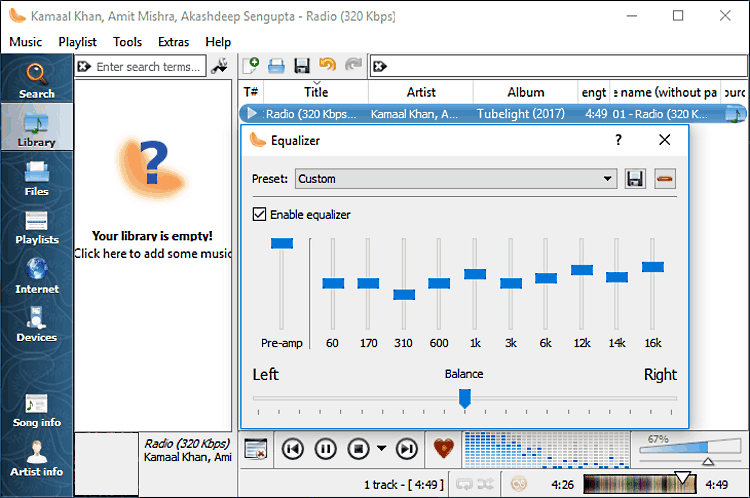 MusicBee Player is a free and open source music player software for Windows. In this player, you can easily add, manage and listen various songs. You can also use this software as a sound booster, as it contains common sound boosting features: Equalizer and Pre-amplification. These features come under Equalizer and DSP [on/off] settings, which is situated near the bottom right corner of this player. To boost sound, just go into Equalizer, then increase Pre-amplification and Equalizer frequency values to boost sound. For each channel, you get a maximum boost of 15 db. Apart from that, you can also choose 10 band or 15 band frequency Equalizer according to your need. Be careful while increasing Equalizer frequency bands, as you can completely distort audio output if you increase band values more.